You might be wondering what sleep apnea is. Sleep apnea is a sleep disorder where the person either stops breathing completely or has very shallow breathing. These events cause the body to wake up and make the person gasp for air. Sometimes these events can sound like severe snoring or just really strange sounds. The airway actually becomes constricted enough that OSA sufferers are unable to breath properly. When the breathing is affected like this, the blood doesn’t get enough oxygen, and the brain gets a signal that it is time to wake up to get the throat open and start breathing normally again. In very severe cases, this can happen as often as 100 times an hour. That is much different than simply snoring. Some snorers wake up totally refreshed from a great night's sleep. Even though they are heavy snorers, they are able to go into a deep sleep (REM sleep.) Their partner, however, may not have slept quite as well! A sleep apnea sufferer is in a state of light sleep for the majority of the night. They suffer from a constant state of sleep deprivation. You may be wondering if you have sleep apnea and need to treat it. There is really only one way to find out and that is to do a sleep study. You may need to go to a clinic to be observed overnight to see how many events you have per night. An event is the moment when your brain forces you to open your throat, waking you up slightly or even fully. Click here to read more about apneatic events. A sleep physician will take that data and determine whether or not you need a machine. If it is determined that you do indeed have OSA, the doctor will decide if your condition warrants surgery or if it can be treated with a CPAP machine. Everybody’s sleep apnea is not the same. The sleep study will determine how much pressure is needed to be effective. During the course of the night, a technician will gradually increase the air pressure and monitor your events. A home study could also be done. In a home study, your sleep doctor gives you a machine that records your sleep performance while automatically adjusting the pressure that it delivers. The data is either downloaded and brought to your doctor or, in the case of some CPAP machines like the ResMed AirSense 10, it is sent wirelessly to your doctor. Your doctor will then need to adjust your machine settings according to the data. The old-fashioned way of buying a CPAP machine was to get it prescribed by your doctor. You can avoid this step by buying online. You can save a substantial amount of money buying online as the cost can be many times less than from a durable medical equipment company. Some online stores still require a prescription from your doctor, while others do not require prescriptions. Typically, your doctor will want you to complete a sleep study before prescribing a CPAP machine. In most cases, you will need a referral from your personal doctor, and some insurance companies might require a pre-approval before getting the sleep study. After your sleep study, the sleep center will determine if you have sleep apnea or not. If you do, and it is bad enough (typically 10+ events an hour), they will send the recommendation to your doctor. From there, your doctor can prescribe a CPAP machine for you that is covered by your health insurance. You will want to call your health insurance provider to confirm what kind of coverage is offered. You will typically be directed to a DME, or a durable medical equipment company. They will have everything you need including the machine, masks, hoses, etc. However, they will charge you MULTIPLE TIMES what the actual item sells for online. They are notorious for charging absolutely ridiculous amounts without telling you how much things cost. Depending on your health insurance coverage, you could be on the hook for 100% of the bill. An air pump takes in the air in your room. It gets compressed, and the compressed air is sent through a hose that attaches to a mask on your face. The mask helps send the air into your throat, and the pressure from the air keeps your throat from collapsing. If your throat is able to stay open, your blood will get the oxygen it needs. Then the brain won’t give your body a signal to wake up enough to open your throat. Thus, you stay in a deep sleep cycle and wake up feeling refreshed. You could start seeing relief the very first night. Using a CPAP machine does not cure OSA. It is a treatment. Even though you might get relief right away, if you stop using it, the benefits vanish just as quickly. The first night you stop using it, you will likely have as many events as before you began to use the CPAP. There are not usually any serious side effects from using a CPAP machine. If users have any, they are generally minor and can be easily solved by making adjustments. This is the most commonly reported CPAP side effect. Air is constantly flowing through the nose and mouth and will inevitably dry you out. For some, this is not an issue. For others, it is very uncomfortable and, in rare cases, can cause frequent bloody noses. This problem can be solved by using a machine that has a humidifier function to keep moisture in your airways. Having a mask strapped to your face covering your nose and mouth can be very claustrophobic. Adding air pressure to the mix does not help that feeling much. The best way to get rid of that sensation is to desensitize yourself to wearing the mask. For a few hours a day, the mask should be worn while watching TV or doing some basic chores. Eventually, you will not even notice that you are wearing it and won’t feel claustrophobic when you put it on at night. An even simpler possible solution is to use either a nose mask or nose pillow. These two variations don’t cover as much of your face leaving some to not feel that claustrophobia to begin with. If your mask is too tight, the pressure from the air could actually cause some uncomfortable lines on your skin where the mask seals to your face. In rare cases, the forced air can lead to a rash in people with sensitive skin. If this happens to you, try finding the right fit for your mask. It may just need to be loosened. If it persists, talk to your doctor. You may either need a new mask or the air pressure should be adjusted. Patients reporting an increase in heartburn are likely swallowing the air. The air pressure could be a little too high and is going down the esophagus and into the stomach leading to indigestion. You may just need a pillow to prop you up a little higher on the bed, or you may need the pressure adjusted. Heartburn medication may also be needed. In any case, you should talk to your doctor. Most people actually see a decrease in heartburn once they start treatment. If irritation is being caused by the forced air from your CPAP machine, your body might produce excess mucus in your sinuses. To combat this, try using a heated humidifier. If it persists, keep adjusting the moisture level until you find the right setting. You may need to take some antihistamine to treat the excess mucus. Just about all of these side effects are caused by the air pressure; however, none of them are serious enough to stop treatment. Remember, there is a solution to every one of them. The most serious side effect is to stop using your CPAP machine because it is too uncomfortable. Sleep technicians have heard it all and are experienced in providing solutions to your discomfort. Before you hang up your mask and call it a failure, talk to your sleep care provider to learn how you can deal with any of these side effects. Sometimes, all it takes is a slight change in settings, or a new mask. I originally had a full face mask. After two weeks of being uncomfortable and cursing my CPAP machine, I switched to a nasal mask. Now, I am comfortable when I sleep and don't have any side effects from my CPAP therapy. Many of today’s machines are designed with comfort in mind. They understand that if your machine is uncomfortable, it might be causing you to not get the full benefit of dealing with our sleep apnea. That is, waking up refreshed and energized. Comfort features are there to make sure you get the most out of your CPAP machine and don’t continue with your sleepless life. Here are some of the common features that will keep you comfortable. Older machines would pump out the air at the prescribed pressure level as soon as you turned the machine on. That made it difficult for people to be able to fall asleep. The ramp feature found on many CPAP machines starts a lower, more comfortable air pressure and then slowly “ramps up” to the prescribed pressure. It can be set with a timer, up to 45 minutes in most cases, with incremental increases in pressure to let you get used to it and allow you to fall asleep. Some CPAP machines have an auto ramp feature that senses a difference in your breathing when you fall asleep and then increases the pressure. Many users of CPAP machines feel a great deal of discomfort when exhaling against full air pressure. In some cases, it heightens the sense of claustrophobia. Today’s machines have a sensor that lowers the air pressure upon exhalation to reduce that discomfort. Though it might not be a must-have feature for many users, having a start sensor when the mask is on and breathing has started is a welcome addition to many. Getting your mask on just right is sometimes a bit of a hassle. Trying to do it when the air is pumping makes it even harder. Obviously,you can put your mask on and then turn on your machine. You can also change the channels on your TV by getting up and manually doing it. Wouldn’t you rather just use the remote? I thought so. If the noise of your machine were to be a distraction,then it would certainly impact your sleep. These days, CPAP machines register barely above a whisper. That’s great news for the CPAP users and their bed partners. Many spouses are adversely affected by their partner’s sleep apnea. Having it quiet makes their life much more comfortable as well. Cold, compressed air flowing into your nose and mouth is not the most pleasant feeling. It is uncomfortable and can lead to dry mouth and sinuses. Most CPAP machines are equipped with a humidifier that can be adjusted according to user preference. If you live in an arid area, then having that bit of moisture really helps and, on those cold nights, the heated air can be very soothing. Using a humidifier on a CPAP machine often leads to condensation build up in the hose that can eventually make its way as droplets into your mask. That doesn’t help you stay asleep. 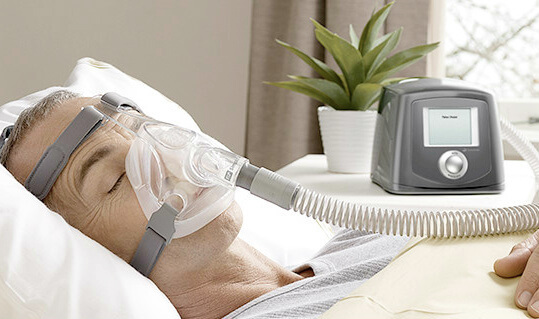 Click here for a review of the Philips Respironics DreamStation CPAP. You can travel with your at-home machine or buy one made specifically for travel. Read our article about the best travel CPAP machines. If you are buying through a durable medial equipment provider, they typically require a prescription. However, there are several online stores that sell them without requiring prescriptions. There is nothing technical required to maintain it. The air filter should be replaced regularly according to the manufacturer's instructions. Regular cleaning should also be done. Cleaning is simply keeping the unit free of dust, the water chamber for the humidifier emptied and cleaned, the hose and mask regularly cleaned. If the power goes out at night, you'll probably wake up quickly from the change in breathing. If you're worried about this, many CPAP machines can run on batteries. These are usually sold separately as it is an optional feature. There are batteries that are single or multi-day, or you could even get an adapter to plug your machine into your car lighter outlet. Can I adjust my pressure settings without seeing my doctor? In most cases, yes, you can change the settings yourself. To do so, you'll want to perform a Google search for your model to find out how to change the pressure settings manually. It is a good idea to at least consult with your sleep doctor before making any changes. The data that your machine records will indicated if you have the correct settings, and changing them may result in poor performance. How long will I have to use a CPAP? Unless you get surgery to alleviate your sleep apnea, you will probably need to use a CPAP for the rest of your life. Some people have found their sleep apnea has lessened, or even disappeared after losing weight. Once it becomes a habit, it isn't a bother to use it every night. The alternative is a lifetime of sleepiness at best, and health complications at worst. Your machine will do all of the work for you, but you will help your machine help you by keeping some simple ideas in mind. Probably the most overlooked practice is to make sure that you have a mask and hose that are compatible. If your mask is not suited to your machine, you may find it leaking air,and that will affect your performance greatly. Since your CPAP machine draws in air, the vent should be kept away from blankets or curtains. If they get too close, the vent will get blocked,and it won’t be able to keep the proper air flow and pressure. The air filter inside your machine is very easy to replace or clean. It’s usually as easy as opening up the door and removing it. Some are washable, others are disposable. It’s a good idea to check them before the manufacturer’s suggestion for replacement schedule. Your room might be dustier than normal causing it to get dirtier earlier than you think. The last, and most important, item to remember is to make sure your sleep technician has access to your sleep performance data that is recorded by your machine. Your settings may be off and you won’t realize until that data gets analyzed. Your doctor will either change the settings on the machine at the office or tell you how to adjust the settings yourself. Either way, this adjustment will keep your machine at the top of its game. Now that you know a bit more about what a CPAP machine is and what it does, you can see if you actually need one. If you think you have sleep apnea or have already been diagnosed but wanted more information, don’t delay. Get yourself in touch with a sleep specialist and find what treatment is right for you. You’ve already suffered long enough. Getting yourself a CPAP machine will dramatically improve your quality of life and more importantly your health.